Farmers in the area bought the two acres that comprise the cemetery in 1878. It was first known as the Norwegian-Danish Evangelical Lutheran Conference Cemetery and later as the North Fertile Cemetery. It now is Chapel Hill Cemetery. The last burial was in 1939. In 1976, a group of neighbors cleaned up the site, which was overgrown with trees, and cleared the 40-rod entrance driveway. The Historical Society accepted a gift from Tom Fretty of a miniature (8-by-12-foot) church, which was built at Manly in 1930 for Father Ehl, the pastor of the Sacred Heart Church in Manly. 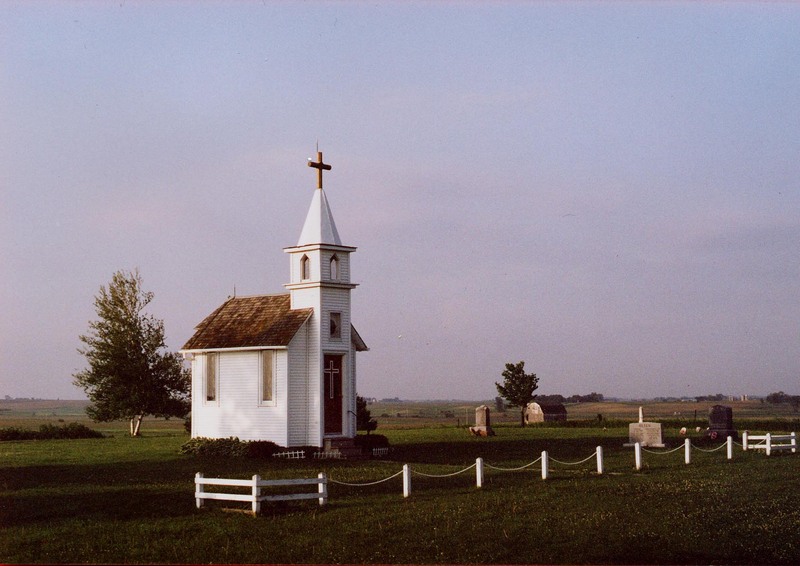 This tiny church was moved in 1982 to the cemetery and renovated. The church was dedicated on Oct. 9, 1983. The location, high on a hill three miles north and west of Fertile, affords a beautiful view for miles around. The church is open only by appointment: Call Curtis Evans (641) 588-3333. Location: Three miles northwest of Fertile. Take Highway S18 (Dogwood) to 370th St., then west ¼ mile. Lane to church is on the right.